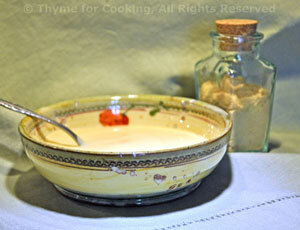 Thyme for Cooking easy recipes: Baked Ham with Mustard Sauce. If you are buying the shrink-wrapped, dry-smoked kind 1 package should be enough. If you are buying the moist, European kind that is pre-sliced, paper thin, you will want 2 - 3 slices per person depending on how big the slice. Mince shallots and garlic, snip chives and tarragon if using fresh and put all in medium bowl with vinegar, juice and mustard. Add oil very slowly whisking all of the time. It should incorporate as you add it. If it does not, stop adding oil for a few moments and just whisk. Continue until all oil is added. Add salt & pepper if desired. Tear enough lettuce for small salads and put in a medium bowl. Add 2 - 3 tbs vinaigrette and toss well. Taste and add more vinaigrette if desired. Divide salad and put on dinner plates - off to the side. 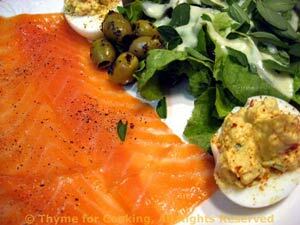 Artfully arrange salmon by lettuce, sprinkle each plate with capers, add desired amount of olives and serve. 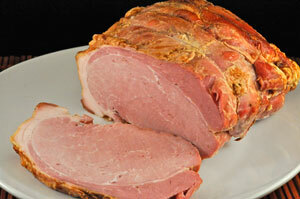 A fully cooked ham should be baked to an internal temp of 140F (60C), about 20 minutes per lb. A ham that must be cooked should reach an internal temp of 150F (65C), 35 minutes per lb. for small hams and 22 minutes for larger (over 5 lbs) hams. All times assume a 325F (165C) oven. Put ham on rack in roasting pan and roast in 325F (165C) oven. About 30 minutes before it's done mix the sugar, mustard and vinegar. Remove the ham from the oven. Remove the skin if there is any, score the fat with a sharp knife (diamond pattern is pretty). Pat the brown sugar mixture over the top of the ham and return to oven. Finish baking. Remove ham and allow rest for 15 - 20 minutes before slicing. A timeless tradition in my large, extended family. The original recipe came from "The Anderson House", a small family run hotel in my home town. For some, it's the only reason to have ham! Can be made ahead. Crack the egg into the top of a double boiler and whisk until beaten. Add sugar, milk and mustard, whisk well. Cook over simmering water for about 5 minutes, until sugar and mustard are dissolved and mixture is hot, stirring occasionally. Add vinegar and continue to cook until thick. Remove from heat, stir in butter and salt. Refrigerate. Good with almost everything and keeps a long time. Note: if you don't have a double boiler, put a metal bowl on a saucepan partially filled with water. The bottom of the bowl should not touch the water. Scalloped Potatoes have long been a favorite at our house. They're easy and easily expanded to serve more. This serves 4 or will be for 2 meals. Cut onion in half, then in half again, (so you have onion quarters) and slice as thinly as possible. Melt butter in a large skillet. Add onions and sauté until soft. Remove onto a plate and set aside. Add potatoes, 1/2 cup milk and heat to just below boiling. 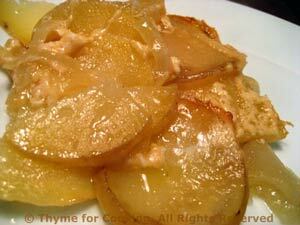 To assemble: Put 1/2 of the potatoes in the bottom of deep baking dish, spreading out with a spoon or spatula. Spread the onions evenly on top of the potatoes. Layer the cheese on the onions. Top with the rest of the potatoes. Pour the remaining 1/2 cup milk over all, cover with foil and bake (375F, 185C) for 60 minutes. Uncover for last 15 minutes of baking time. This is a classic on British holiday tables. If using fresh chestnuts: With a sharp knife cut an 'X' through tough outer shell. Put in a saucepan and cover with water. Bring to a boil over medium-high heat. Reduce heat to medium-low and boil for 5 minutes. Remove pan from heat. Removing 1 chestnut at a time peel off shells and inner skin. Chestnuts must stay hot to peel easily. If they cool down too much while you are working, bring them to a boil again. Put peeled chestnuts into a saucepan, cover with beef broth, bring to a simmer over medium heat and simmer for 15 minutes, until tender. If using canned chestnuts: Rinse and drain. To cook Brussels sprouts: Slice a bit off of the stem end and peel away the outer leaves - any that are damaged, wilted or discolored. With the tip of your knife make a small X in the stem end - that, supposedly, aids even cooking. Put into a saucepan with 1/2 cup beef stock, and enough water to almost cover. Cover and bring to a boil. Reduce heat and simmer until done, 10 - 15 minutes. They should be just tender when pierced with a sharp knife. When done remove, drain and set aside. Both steps can be done earlier in the day and finished at the last minute. To finish: Melt butter in a medium saucepan over medium heat. Add thyme and pepper and combine. 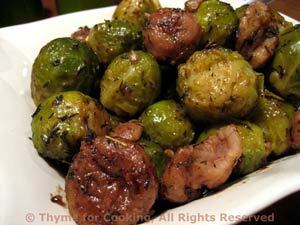 Add sprouts and chestnuts and sauté about 5 minutes (longer if sprouts and/or chestnuts are cold). Serve salad, relax, toast the holiday! Serve all... Don't forget the mustard sauce!